These tubes contain spray coated silicon and micronized silica particles to accelerate clotting .It also contains an inert separator Gel on the base of the tube for serum separation .Gently invert the tube 180° 8-10 times and after coagulation, centrifuge at 2000-3000 rpm for 10 min. at room temperature. The specific gravity make the barrier gel move upward to the serum- clot interface during centrifugation and it forms a stable barrier separating serum from fibrin cells. This barrier provides stability of certain parameters of the tubes under the recommended conditions for up to 48 hours. 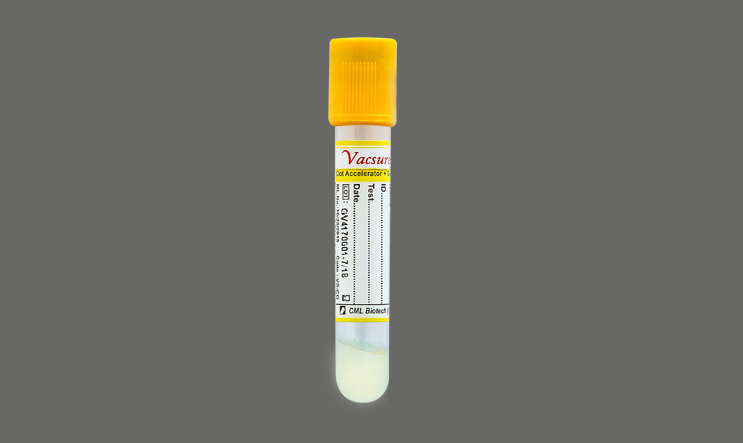 Used for serum determinations in Bio-Chemistry, Immunology and serology. Antibody screening, Indirect Anti globulin Test, Cross match, Antigen Typing, IM, and Drug assays etc.